In 2014, The Symphony Hall corp. will open a new chapter of The Symphony Hall. We are ensuring preservation of the great history of the hall even as we continue to expand our musical offerings. After passing the promenades among trees, the elegant white concert hall adorned with ten Grecian style columns appears majestically in front of us. 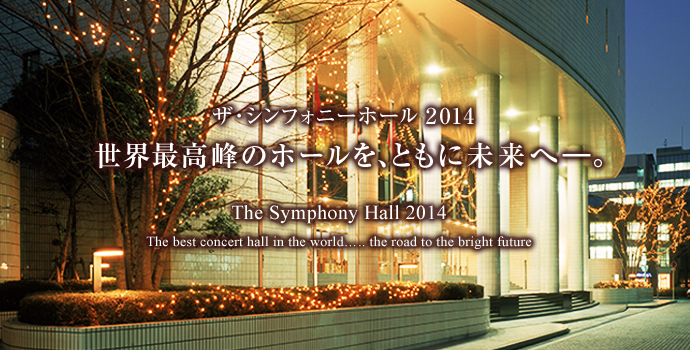 Since The Symphony Hall appeared in Osaka, many artists in the world have formed a deep love for the hall. People feel this hall is special because we could see the effort and wisdom of all creators, technicians and hall staffs. Particularly notable future of the hall includes the state of the art acoustic system. The cork floor, the carefully designed wall, and the sound reflection board attached to the ceiling appearing like a bird in fly allows for two full seconds of reverberation. This is making the ideal reverberation for classical music. 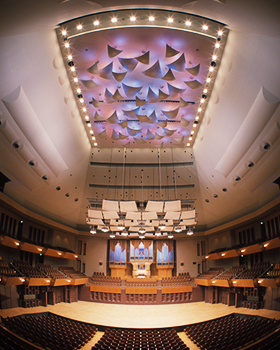 A 1704-seat hall is designed in an arena style allowing optimal visibility to the entire audience. 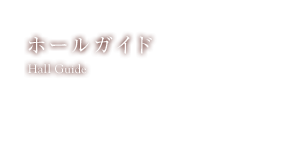 There are also a comfortable café and a lounge open for all performances. These features help to create the unique and special experience The Symphony Hall has to offer.